The Benton-Tama Nutrient Reduction Demonstration Project works with landowners to demonstrate the benefits of nutrient reduction practices. 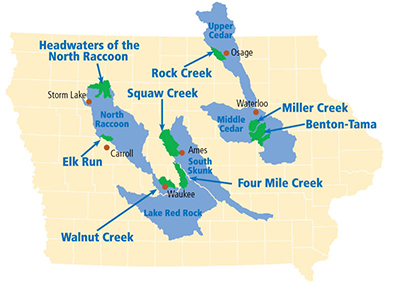 The project is located within the watersheds of Lower Wolf Creek, Rock Creek and Pratt Creek, which are in Benton and Tama Counties, and includes 92,281 acres. A unique aspect of the project applies to cropland devoted to seed corn production. The project uses practices, field trials, demonstrations and education to support conservation efforts that work in tandem with seed corn production. During Phase 1 of the project, producers in the watershed have installed saturated buffers, planted cover crops and implemented nutrient and tillage management practices over the past three years. The investment in technical and financial assistance, paired with strong partners is paying off. In 2016, cover crops were adopted on at least 15 percent of the row crop acres, compared to a statewide average of about 2 percent. Aggressive plans for 2017 include installing two bioreactors, two saturated buffers and planting 4,000 more acres of cover crops.